Stone is one of the first building materials ever used by mankind. It’s been used to construct everything from humble dwellings to some of our most iconic structures. As a building material, there’s virtually no manufacturing needed and it’s so durable that many of the stone structures we built long ago are still standing today. Simply put, only a few of today’s ‘green products’ can equal – but for whatever reason, stone has been largely overlooked by the green building movement. In fact, stone brings with it significant advantages over steel, concrete, glazed glass and other laminated products, making it perhaps one of the most undervalued building materials on the market. Stone is 100% reusable and can be salvaged for new construction projects, including pavement or crushed aggregates. Stone is one of the toughest materials on the market today, as it’s flame and weather resistant. Stone requires little maintenance and lasts longer than nearly every other building product out there, today. Stone is a superior insulator – whether you’re looking to preserve heat or build a room with incredible sound proofing capabilities. 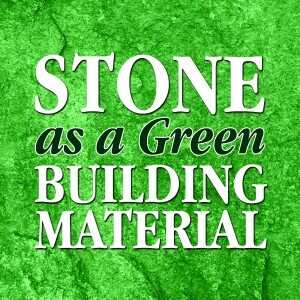 Although it can take a lot of careful consideration and planning on your part, building green by using stone is one of the more sound investments you can make. It can help conserve resources, prevent pollution and minimize waste – all of which are tenants of any sound, responsible green building initiative. More and more designers today are being asked to identify green building materials but don’t always have the information they need. Simply put, stone is one of the most effective products on the green market and if you’re planning to take that next big building project and you want to keep it environmentally friendly, then stone should be one of the first materials you consider.